Are you getting bored with the same-old, same-old when it comes to salad? You know what I’m talking about — that caesar salad you order every time you’re out for a work lunch. Or the same field-greens-and-balsamic-vinaigrette you make to go along with dinner. I mean, salad’s great and all — our bodies cheer for that infusion of antioxidants and fiber. However, our taste buds need some intrigue and excitement in their lives too, right? That’s where this Thai Chopped Salad comes in — such a treat for the taste buds AND the body. There are so many fun flavors, colors, and textures going on this dish. It’s perfect as an entree salad at home, or packed up as a potluck dish. 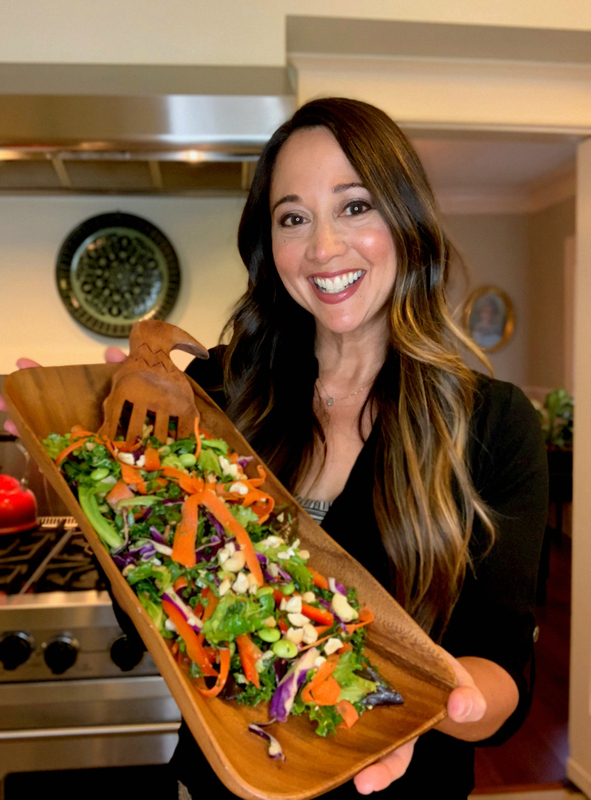 I hope you enjoy busting out of that same-old-salad rut with this beautiful and delicious dish. First, let's make the salad dressing. Put the miso paste, water, garlic, ginger (or ginger juice), sesame oil, and lime juice (and zest, if using) into a small bowl or mason jar. Whisk everything together, then stream in the olive oil while whisking. Keep going until everything is creamy and dreamy. Note: please taste before adding salt. You probably won't need to because of the miso. Now for the salad... let's start by cooking the edamame. All you need to do is bring a pot to boil, and then add the edamame beans. Boil for a few minutes until tender. Drain and rinse under cool water. Set aside to cool. While the edamame beans are cooking, you can get started on prepping the veggies. For the kale, just strip the stem out with your hands, and slice the greens into ribbons. Then, thinly slice the cabbage. For the carrots, you could chop them, or make them into ribbons using a carrot peeler (that's my favorite way). Then, seed and chop the peppers, chop the cilantro leaves, and slice the scallions. This all sounds like a lot, but it'll only take 5-10 minutes. Better yet, recruit someone else — family members, roomies — to help you. No reason why you should be the only person working in the kitchen! Now, we get to assemble the salad. 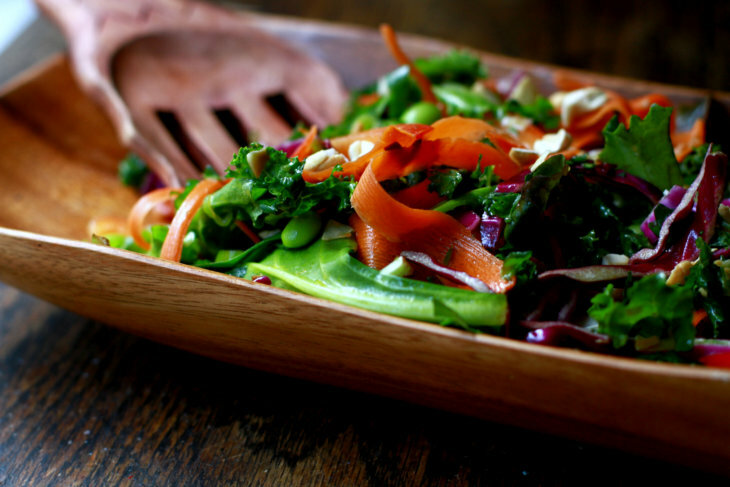 Place all of the greens and veggies into a large salad bowl. Drizzle with dressing, and toss until all of the leaves and veggies are lightly coated with vinaigrette. To finish, scatter the chopped nuts and coconut over the top. Serve with extra dressing on the side. So yummy! I hope you enjoy this gorgeous and delicious salad.